Did you know that 1 in 11 seniors face hunger each day? Did you know that 1 in 11 seniors face hunger each day? That number might seem shocking but that is the reality. If YOU had the opportunity to help change that statistic, would you? Southern Rhode Island Volunteers has been bringing meals and support to over 45 seniors per month. With continued support from people like you, nutritious meals can continuously be provided to those who need it most. You can help us this #GIVINGTUESDAY, November 28th, by supporting our charitable on-line donation drive to help ensure meals and miles happen this season. 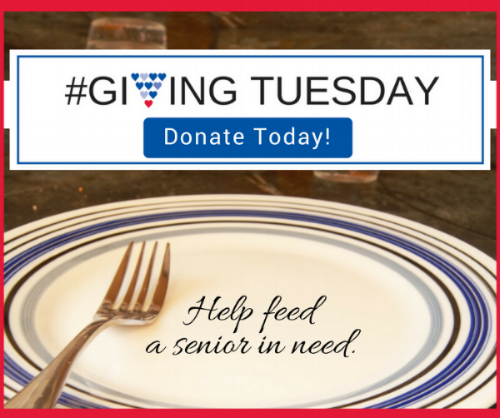 Just a $10 donation helps bring 275 meals a month to seniors in need in our community. Please share this story and discover how good it feels to share the meaning of giving thanks. Looking to meet your Community Service hours? We challenge you to invite 1, 2, or 3 friends to come volunteer in our local community to help ease the difficulties of winter weather.